Which roads will be salted? You can see the salting routes on the Surrey Winter Online map. There is a key to the map layers, found by selecting the Legend option from the menu on the bottom of the screen. How do we decide when to salt? We use weather forecasts, computerised ice prediction systems and information from roadside weather stations. Priority 1 roads are the most important roads in terms of the volume of traffic carried, and are first to be treated in advance of any forecast frost, ice or snow. This includes all A and B roads carrying more than 8000 vehicles per day as well as main access routes to hospitals, bus routes and roads that link salting routes with those of adjoining counties. During periods of prolonged and persistent frost, ice or snow, we extend salting to include these roads but only once priority 1 roads have been cleared. Priority 2 roads include roads carrying more than 4000 vehicles per day, main access routes to industrial areas and secondary education establishments, access roads leasing to railway stations, roads used by buses and steep hazardous gradients and on bridges where local icing conditions are known to occur. We will restrict salting to Priority 1 roads particularly A roads, main access routes to large/medium populations and main access routes to A&E hospitals and all fire stations. Pavements:- We do not routinely salt pavements. However when there is prolonged frost, ice and snow, we do try to clear pavements in towns and those areas serving hospitals. Areas we DO NOT SALT: We do not salt residential roads, alleyways, car parks and private property unless they are on the priority list above. How Salt works:- Salting does not mean that the road surface will instantly become ice free. Salt works by turning the ice or snow surrounding each salt granule into a saline solution which has a lower freezing point than water. The action of the traffic helps the salt to be more effective by moving the salt around and eventually melting all the ice or preventing ice from forming. Do you have a few hours to spare helping your local community when it snows. If so, you could become a “snow angel”. Winter weather severely restricts peoples’ ability to go about their normal routine, particularly the most vulnerable. Snow Angel’s help by ensuring pavements are cleared of snow and ice, allowing people to access local services, particularly doctors surgeries, local shops, schools and transport links. It also allows carers to get to their clients, ensuring that they are care for and reduces the risk of people falling over and hurting themselves. 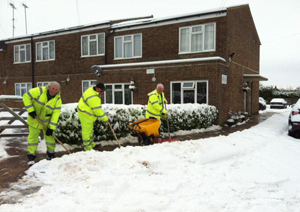 When winter weather is due, your local snow angel group will contact registered volunteers and ask them to help by pre-salting pavements before the snow comes down or by clearing snow and ice after it has fallen.